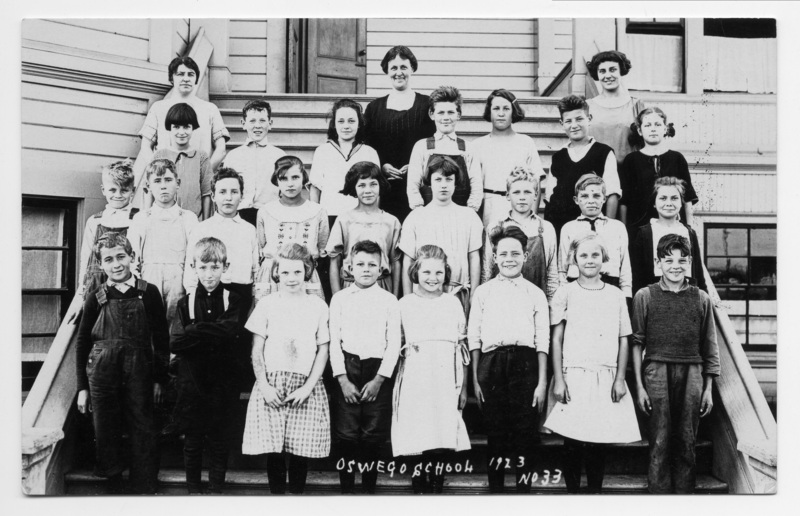 1923; 053, Oswego Schools, class photos; 5th grade. Lst row l to r: __Headrick, __Larson, __, __, Marjorie Ranger, __, Josie Pollard, __. 2d row: __Fox, __Schaubel, Norman Reynolds, __, __, Roma Confer, __, __, Wanda Davidson. 3d row: __, Bill Wanker, Constance Kochler, Norman? Baker, __, __, Ava Bickner. 4th: __, teacher?, __. Description Scanned as B & W. Printed on front: Oswego School, 1923, No33. Transcription 1923; 053, Oswego Schools, class photos; 5th grade. Lst row l to r: __Headrick, __Larson, __, __, Marjorie Ranger, __, Josie Pollard, __. 2d row: __Fox, __Schaubel, Norman Reynolds, __, __, Roma Confer, __, __, Wanda Davidson. 3d row: __, Bill Wanker, Constance Kochler, Norman? Baker, __, __, Ava Bickner. 4th: __, teacher?, __.